Group member Tony Wall, a well-established 7-1/4in gauge modeller, was looking for something smaller to model as the years roll by. On looking at the wheels market he felt he could apply the same principles to producing 7mm scale wheels using modern manufacturing techniques as he uses for the larger gauge. In this article he shows how he believes the standards can be raised to the next level. Why do manufacturers of the very many fine locomotive kits available in our scale usually omit wheels from their offerings? 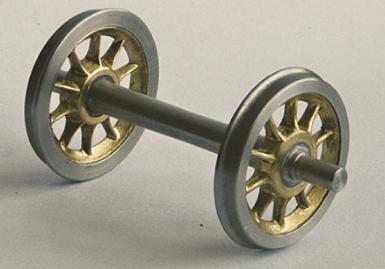 Why are scratch builders so often obliged to compromise when selecting wheels from their models? Why is is so difficult to find convincingly accurate wheels, even for the most frequently modelled, popular prototypes? The answer to all these questions must be the same. Because wheels are probably the most awkward part of a locomotive to reproduce satisfactorily. A major challenge for modellers and manufacturing suppliers alike. Although there is commonality between classes, the BR Standards are a good example, most locomotive types have wheels unique to their class, or closely related classes. Most obviously, variation exists in diameter, the number of spokes, balance weights and whether the crank boss lies in alignment with a spoke, or oriented between two spokes. However, other subtle but nevertheless important differences exist in spoke section, rim section, boss and crank boss shape and size. Additionally, these bosses are often noticeably heavier on the driving wheels than on the coupled wheels. The offset (or not) of the boss, the flare of the spokes into the boss, their taper and the radius with which they fillet the rim and boss all add further characteristic nuances. All this may sound somewhat pedantic, but please read on because I think I’m about to cheer you up a little! Whilst most 7mm scale railway modellers graduate from the smaller scales, attracted by the greater authenticity achievable, I have moved from the larger, live steam arena, looking for something readily manageable as the years take their toll. Some time ago, whilst making wheels for a 7-1/4in gauge 9F, I wondered if the technique of machining wheels from the solid could be transposed to 7mm scale, and, when an attempt was made, the results surprised me. Comparing 7-1/4in gauge and 7mm scale wheels for a BR 9F made using the same manufacturing approach. 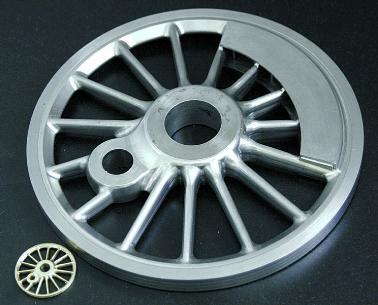 To date, most wheels offered to modellers by the trade have usually been produced by stamping, die-casting, sand casting or investment (lost wax) casting, these methods generally providing an ascending order of product quality. Times move on though, and computers with modern machine tools, using the traditional basic disciplines of milling and turning, can bring further improvements and repeatability, by directly machining flat metal bar, either mild steel or brass. Before describing the developed methods in some detail, however, it is imperative that we lay down, and understand, some manufacturing criteria and stick rigidly to them. Firstly, a high quality accurate product is dependant on upon a high quality accurate data feed. I appreciate that this is obvious, but it cannot be overstated. It is no more difficult or time consuming to make a correct reproduction than the incorrect one which usually arises out of bad information or poor guesswork. Stemming from this assertion is the need for authentic source material, because considerable investment of time and effort is required to produce the necessary virtual 3D computer model for our wheel. The ideal source material is, of course, the original railway drawings from which the full size articles were produced, but unfortunately these aren’t always available. Where they are, it is a reasonably straightforward process to scale everything into a CADCAM system to give us the 3D model, and this neatly brings us to the second of our criteria. Establish, and keep to, a scale constant which is the reciprocal of 43.5429, viz. 0.022966. Set this factor in concrete for all time, don’t be tempted to alter it in any way and you’ll be able to toggle at will between full size and 7mm scale when generating the computer model. Thirdly, concentrate on the basic geometry of the wheel centre, remembering that the original was a steel casting with no sharp corners, each entity flowing smoothly into its adjacent neighbour. Don’t be tempted to incorporate the balance weights or tyres, these are best added later. Just create the wheel centre “casting”. 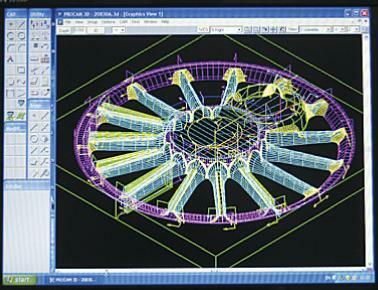 Screen View of the computer model for the wheel centre casting. At this point, it may be thought that I am assuming the kind of equipment I am fortunate enough to have the use of is widespread among the modelling community. That is not the case, this is an industrial facility, but I merely find the best way to illustrate my methods is to proceed as if I’m writing an instruction manual! The starting material is a 60mm square of 4 or 5mm brass plate, hereafter called the blank. Brass is easier on the small milling cutters, but mild steel can be used. Four 5mm holes are drilled and reamed in a square formation in the very corners using a vertical machining centre. Two of the diametrically opposed holes are used or silver steel location pegs and the other two are for holding the blank on to a fixture featuring the same square pattern of holes. The fixture is held horizontally disposed and the hole pattern (say 50mm square in this case) is drilled and reamed, the top of the fixture being milled level. With the blank accurately located by the location pegs (dowels) and firmly held on the fixture, it can be milled to the shape of the outside of the wheel, using the program produced by the CADCAM system, and a series of both flat and ball nosed milling cutters. The system will have defined the cutter diameters and generated the tool paths in the three linear dimensions. If the centre of the wheel is defined as the datum point (x0,y0) it will be seen that after completion of the outside, the blank can be turned over on its fixture, and the inside milled to shape. In the unlikely event that the wheel is symmetrical about its centre split line, then the same program could be used to machining the inside face, but life isn’t usually so obliging so a separate program will be needed. Because care has been taken to ensure that both halves of the machining sequence have been executed in exact kilter, we should now have an embryo wheel which needs only to be trepanned to a suitable diameter to allow final turning to fit the tyre whilst being held on a peg turned in situ on the lathe. 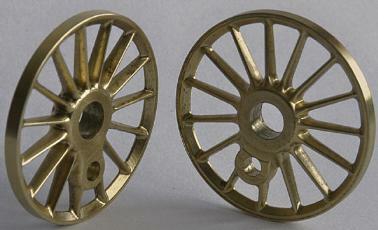 A driving (coupled) wheel showing the correct spoke shape on both inside and outside. A completed pair of tender wheels with centres, tyres and axles. 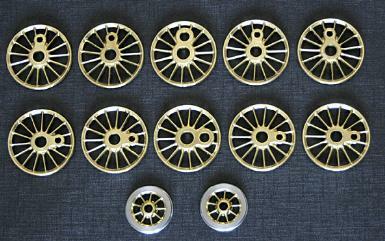 A complete set of 9F wheels in 7mm. Note the larger boss and crankpin hole for the centre drivers. This has been a very much abbreviated account of a process which does produce a pretty good product. The photographs show what can be expected, and my aim here is to stimulate interest. The CADCAM software systems which are used in this sort of work are quite numerous but all are characterised by complexity, and here I pay tribute to the staff (none of whom are railway modellers or enthusiasts) who have evolved the models and programs used in this project. We have been concerned here with the wheel centres, but tyres, axles, balance weights and crankpins might be the subject of a future article.